Coach Mike Zimmer is no stranger to the NFL draft trade game now that he's in his fourth draft with general manager Rick Spielman, who has made 22 draft trades since 2012. Vikings team staff oddly began setting up a conference call with recent pick Jaleel Johnson, just as they were seconds away from making another draft pick. There was nothing to see at the NFL Draft in Philadelphia, anyway. Minnesota wasn’t about to make that pick. 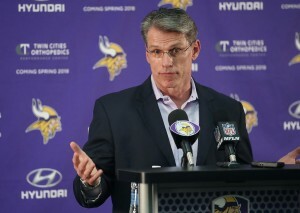 General Manager Rick Spielman made an NFL-leading sixth trade of this weekend’s draft when he dealt that fourth-round pick (139th) to the Chiefs in exchange for two fifth-round picks (170th, 180th). Accustom to the Vikings’ dealing ways under Spielman, Jamaal Stephenson, the team’s director of college scouting, settled in for another wait beforepickinga prospect that his scouting staff hasspent nearly a year evaluating. Vikings head coach Mike Zimmeris no stranger to the dealing in his fourth draft with Spielman, who has made 23 draft trades (and counting?) since taking full control as GM in 2012. Seven trades have been made by the Vikings during this draft. - Traded up to No. 41 in the second round for RB Dalvin Cook. Sent No. 48 and a fourth-round pick (No. 128) to the Bengals. - Traded up to No. 70 in the third round for C/G Pat Elflein. Sent No. 79 and a fifth-round pick (No. 160) to the Jets. - Traded back from No. 86 in the third round to No. 104 with the Chiefs, picking up a fourth-round pick (No. 132) and a seventh-round pick (245th). -Traded back from No. 104in the third round to No. 109 with the 49ers, picking up a seventh-round pick (No. 219). -Traded back from No. 132in the fourth round to No. 139 with the Eagles, picking up a seventh-round pick (No. 230). -Traded back from No. 139in the fourth round to No. 170 in the fifth with the Chiefs, picking up a fifth-round pick (No. 180). -Traded back from No. 199in the sixth round to No. 201 with Washington, moving up in the seventh round from No. 230 to No. 220.